Led by Professor Brian Wilson, this research project examines how violence, conflict and environmental issues are covered in sport-related media, with a particular emphasis on what might be considered peace-promoting and environmentally-sensitive journalism (or what our research group has termed ‘sport journalism for peace’, or SJP — and ‘environmental sport journalism‘, or ESJ) (see Wilson, 2012, Sport & Peace: A Sociological Perspective, chapter 9). The project is funded by a SSHRC Insight grant entitled “Fostering ‘Sport-for-Peace Journalism’ and a Role for Sociologists of Sport.” Research to date has focused on: (a) media coverage of activism and environmental issues around the 2018 PyeongChang Olympics, 2016 Rio Olympics, 2014 Sochi Olympics and 2010 Vancouver Olympics; (b) ‘what is possible in sport journalism’ — when it comes to writing about social and environmental issues; and (c) lessons offered in textbooks for sport journalists about how to cover socially-charged issues. Wilson, Brian & Van Luijk, Nicolien. (in press). Covering protest at the Vancouver 2010 Olympics: A peace journalism inspired analysis. Sociology of Sport Journal. Yoon, Liv & Wilson, Brian. (in press). Journalism, Environmental Issues, and Sport Mega-Events: A Study of South Korean Media Coverage of the Mount Gariwang Development for the 2018 PyeongChang Winter Olympic & Paralympic Games. Communication and Sport. Forde, Shawn & Wilson, Brian (2018). Radical Sports Journalism? : Reflections on ‘Alternative’ Approaches to Covering Sport-Related Social Issues. Sociology of Sport Journal, 35(1), 66-76. Weedon, G., Wilson, B., Yoon, L., Lawson, S. (2018). Where’s all the ‘good’ sports journalism? : Sports media research, the sociology of sport, and the question of quality sports reporting. International Review for the Sociology of Sport, 53(6), pp. 639 – 667. Weedon, G. & Wilson, B. (2017) Textbook Journalism? Objectivity, Education and the Professionalization of Sports Reporting. Journalism. Published ‘Online First’, DOI: 10.1177/1464884917716503. Wilson, B. (2017 – invited keynote). Sport and Environmental Journalism: Reflections on Media Coverage of Environmental Issues at Recent Sport Mega-Events. 4th International Conference on Sport Communication. Hosted by Chengdu Sport Institute, Chengdu Sport University. July 12-14. Wilson, B. (2016). 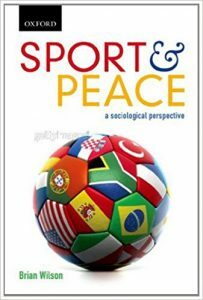 ‘Sport Journalism for Peace’: Reflections on a Research Project and an Argument for Taking Sport Journalism Seriously. Presented at the International Peace Research Association Meetings. Freetown, Sierra Leone. November 27-December 1. Van Luijk, N., Waldman, D., & Wilson, B. (2015). Experiments in ‘Sport Journalism for Peace’ (SJP): Reflections on Coverage of the Vancouver and Sochi Olympics. Presented at the North American Society for the Sociology of Sport Conference in Santa Fe, New Mexico, Nov. 4-7. Forde, S. & Wilson, B.. (2015). Radical Sport Journalism? : Reflections on ‘Alternative’ Approaches to Covering Sport-Related Issues. Presented at the North American Society for the Sociology of Sport Conference in Santa Fe, New Mexico, Nov. 4-7. Weedon, G. and Wilson, B. (2015). Sociologists of Sport and ‘Best Practice’ Sport Journalism. Presented at the North American Society for the Sociology of Sport Conference in Santa Fe, New Mexico, Nov. 4-7. Weedon, G., Lawson, S., Yoon, L., & Wilson, B. (2014). No news is good news? : Sport media research and the question of good journalism. Presented at the North American Society for the Sociology of Sport Conference in Portland, Oregon, Nov. 5-8. Wilson, B. (2014, invited speaker). Sport Journalism for Peace: A proposal, a movement and baseline findings. University of Bath, UK, Physical Cultural Studies ‘International Festival of Ideas’, June 23.